It's a sad state of affairs when a cheap plastic horn is the talk of the World Cup - perhaps it's because the football so far has been pretty dismal - but, undeniably, the vuvuzela has so far been the tournament's major talking point (well, that and the silly new ball). The BBC has reported that it's received 545 complaints about the instrument's incessant buzzing during match coverage, and even players have voiced their disapproval. So what can be done about it? With FIFA saying that it has no plans to ban the vuvuzela, enterprising plug-in developers have stepped into the breach to try and come up with a processing chain that eliminates its sound during TV broadcasts. Waves claims that it's currently working with a major broadcaster to resolve the problem, and recommends a plug-in chain featuring its WNS Waves Noise Suppressor and Q10 Paragraphic EQ. "A combination of dynamic broadband noise suppression and notch filtering is utilised to create the Vuvuzela noise reduction processing chain," explains Waves. "Routing schemes and parameter settings were painstakingly adjusted, contrasted and, compared; multiple instances of each plug-in, with different settings, were ultimately used to achieve optimal results." If you want to try Waves' solution on your TV audio feed, you can download the processing chain from the Waves website. This works in Pro Tools, Waves MultiRack and Cubase (though you'll need the plug-ins too, of course). PreSonus has been tackling the problem as well, and is offering a file for its Studio One DAW that filters out the vuvuzela sound (presumably, you can try this in the demo version of the software). This does its work using the company's ProEQ plug-in - for more details and to download the Studio One file or just the FX chain, go to PreSonus's Voodoo One website. "PreSonus has been tackling the problem as well, and is offering a file for its Studio One DAW that filters out the vuvuzela sound." There are also before and after audio examples that demonstrate the chain in action. UPDATE: Prosoniq has also got in on the act, releasing VuvuX, a free real-time vuvuzela filtering plug-in for Mac. Get it from the VuvuX website (thanks, janmonk). We should also give a mention to Create Digital Music, which showed football fans how to tackle the vuvuzela problem in Linux on Tuesday. 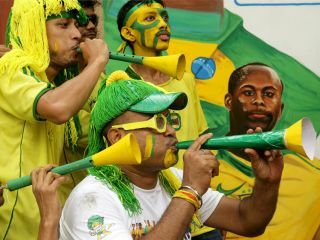 Finally, it's worth pointing out that not everyone hates the sound of the vuvuzela. The Guardian is reporting that a virtual version for the iPhone has just topped a million downloads and is currently the most popular free app in Europe and South Africa. What's more, UK supermarket chain Sainsbury's reckons that it's going to have sold 75,000 vuvuzelas by the weekend, suggesting that, even if you get rid of them on your TV, pretty soon, a small boy is going to blow one in your ear.